Trey is thrilled to be accompanying his father, influential Chicago businessman T Drummond MacIntyre II, on a trip to Constantinople. Armed with a suitcase packed full of his favorite tales of super-sleuths and daring detectives, Trey can't wait for his holiday to begin. So imagine his excitement when, as father and son board the Orient Express, Trey thinks they are being followed by a mysterious stranger. Surely Trey's been reading one too many spy capers? However, as they make the journey across Europe, Trey's father appears distant and evasive. Is he simply busy with work, or is something more untoward happening? 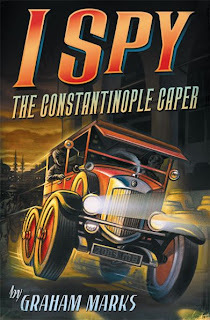 When T Drummond MacIntyre II goes missing, Trey is plunged into the secretive and dangerous world of 1920s espionage, trawling the chaotic streets of Constantinople in search of his father's whereabouts. But while Trey has always dreamed about being a spy, nothing can prepare him for the breathtaking escapades that await him in this exotic and enticing city. The publishers have touted this as a cross between "James Bond and Indiana Jones", but to be honest there is less of the James Bond and more of the Bulldog Drummond in this story In fact, Trey's middle name of Drummond may even be a small tribute to the character created by Sapper back in the 1920s. As for the Indiana Jones comment? Think more "Young Indiana Jones" than the adult incarnation. I found this to be a hugely enjoyable read, with a fast-paced story and a number of engaging characters who appear once Trey reaches Constantinople. Some reviewers have criticised the journey to Istanbul on the Orient Express, and Trey and his father's stop-off in Venice, as being a little superfluous to the overall story. However, Trey is just an ordinary boy with a love of pulp detective magazines, and I feel the journey makes the reader wonder whether Trey is actually being followed or is this just a product of an over-active imagination? Once the action hots up in Constantinople Marks steers clear of the unbelieveable - everything that happens to Trey could happen to a normal boy caught up in events he doesn't really understand. All of the action scenes are perfectly plausible and made more real by the author's use of real-life characters (such as pilot Mario de Bernardi) and his descriptions of exotic 1920s Constantinople. I have just one small criticism of this book. The first part of the book is written solely from Trey's point of view. However, half way through, following a key event in the story, this suddenly changes and there are then various viewpoints for the rest of the book. I cannot imagine an author of adult books 'getting away' with this so it shouldn't really happen in books for younger readers either. Overall, this book may not have the complexity of many adult spy novels, but it is certainly an entertaining read for boys, and would be a great book for boys to read with their dads. First published in 2006 this book quickly developed something of a cult following, fuelled further by the fact that (incredibly) it is currently out-of-print. At the time, fans were heralding Panama Oxridge as the new JK Rowling (in fact, some even initially suggested that Panama Oxridge was actually JK Rowling using a pseudonym). Then it emerged that he was in fact "a well-known and successful author of picture-puzzle books". To my knowledge, Oxridge's real name has still not been published?? There is, however, a rather interesting interview with the author here. So..... if the book is out-of-print why am I reviewing it now? Well, hopefully it will be back in print very soon. Originally it was self-published by the author with rumours of interest from some of the big name publishers, but nothing came of them. Over the last few years I have been a occasional visitor to the Justin Thyme website and just this morning discovered that it is currently undergoing work, with promises of a new website in November! Is it too optimisitc of me to start thinking that this means the sequel is soon to be published (we were originally promised a series of four books)? And if the sequel is finally written, will the first book in the series be back in print very soon? Watch this space!!! Justin’s TV celebrity mother departs on a Congo expedition with her eccentric film crew and Eliza, a computer-literate gorilla. Whilst returning, Lady Henny is abducted, and clues prove that the kidnapper has inside information; someone in Thyme Castle must be a spy – or possibly Sir Willoughby’s old enemy in disguise. Everyone is under suspicion: Justin’s nervy tutor; their snooping housekeeper; the theatrical gardener; an ex-royal butler; and Mrs Kof, their freakishly strong cook. Suddenly, the race against time is on. 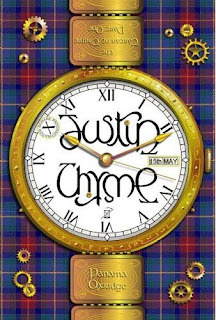 Can Justin convert his vintage motorbike into a time machine, rescue his mum and discover the identity of their resident spy in less than a week ... or will the dreaded Thyme Curse claim another life? Firstly, the packagaing - the tartan cover of this book looks stunning, as do the various illustrations throughout. The title is written in the form of an ambigram, a word or image that can be 'read' not only in its form as presented, but also from another viewpoint, direction, or orientation (and used to great effect by Dan Brown in his Angels and Demons novel). I was hooked from the first chapter of this amazing book. It really is one of those books you just can't put down! Set in a Scottish castle, the story revolves around a complex whodunit mystery that should appeal to adult fans of the genre, as well as the targeted younger readers. On top of a highly original and well constructed story, Panama Oxridge has also created a wealth of eccentric and well-developed characters with such detail that they really come alive as you read, and keep you chuckling throughout. A computer literate gorilla? Who goes online to chat up boys? Panama Oxridge you are a genius! But despite these vivid descriptions of the characters, unlike the Tom Scatterhorn books this does not ever cause you to feel that the narrative is moving on too slowly. The pace is spot on throughout the whole book and you will be kept guessing until the very end. A warning though - once you have finished this book you may just want to read it all over again right away. I spent a good part of the first half of the book flicking back through the pages to look for missed clues, etc. I soon realised that this could be a ridiculously time-consuming task so therefore made the decision that I would read it again in order to make more of an effort to spot the cryptic clues (illustrated and written) that appear to be littered throughout the book. I did manage to restrain myself from writing notes in the margins as I went along though! Overall I cannot recommend this book enough - it really is THAT good. If it is ever published by someone who will give it a decent sized print-run then I can see it becoming a favourite of young readers across the country. Sure to be a massive hit with the boys at school, but we'll just have to wait until February to get our hands on it. edit: Just watched the youtube trailer with some of the boys at school - now even more excited! When a mysterious envelope arrives for Jake Ransom, he and his older sister, Kady, are plunged into a gripping chain of events. An artifact found by their archeologist parents on the expedition from which they never returned leads Jake and Kady to a strange world inhabited by a peculiar mix of long-lost civilizations, a world that may hold the key to their parents' disappearance. I have long been a fan of James Rollins' Sigma Force novels, but I might not last long in my job if I started recommending them to the boys at school due to the level of (occasionally graphic) violence they contain. This, then, is something of a diversion from his normal fare, but only in writing style. It is definitely aimed below the adult market, but his trademark use of action, adventure, science and elements of the supernatural has not changed at all. 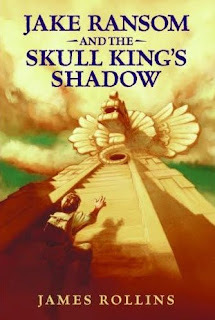 Combine this with a suggestion of time-travel, ancient civilisations (in this case the primary focus is the Maya), and the mysterious Skull King as the villain then you have an adventure story that should appeal even to reluctant readers. James Rollins has been producing books like this for adults for many years and all I can do is applaud his decision to enter the Young Adult market. This is obviously the first in a series of Jake Ransom books, not only because the ending leaves you thirsting for more but also because James Rollins has included one of his trademark author notes at the end where he promises more, but we will have to wait until April 2010 for the next title to be published, entitled "Jake Ransom and the Howling Sphinx". 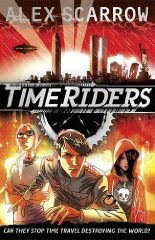 Until I discovered this I was feeling that some of the characters were not being developed as much as others (Jake's sister Kady, for example, is conspicuously absent from a lot of the story), however I am sure that these characters will be further developed in the sequel and beyond. I sometimes face criticism from friends for my love of books written for kids/young adults but for me reading has always been about the escapism, and if a story is exciting and well-written then why should the level of language affect my enjoyment? I have slowly managed to convert a number of friends around to my way of thinking (Harry Potter, His Dark Materials and Artemis Fowl certianly helped me on this mission), and this is another book that I will be recommending to them. I have already emailed the school librarian to make sure she adds it to the next book order. James Rollins produced the novelisation of last year's fourth Indiana Jones film, and there are many similarities between this book and the Indy franchise. I may be wrong, but I guess that being involved in the Indiana Jones book may have created an appetite for producing a series of books where his imagination could be given a free reign than when writing for the adult market. James Rollins himself says "For Jake, I saved my wildest and best adventure of all". 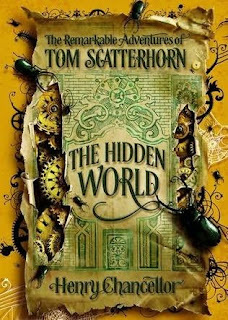 If you have already read my musings on the first book in the Tom Scatterhorn trilogy ("The Museum's Secret") then you will be in no doubt that I was awaiting the sequel, "The Hidden World", with a large amount of excitement. I even made sure I had finished the book I was already reading so I could dive into this one as soon as it arrived on release day. The synopsis had already created a feeling of heightened anticipation: new characters; more time travel; a new world with an exotic name; and, of course, the return of the sinister Don Gervase Askery and his creepy and increasingly psychotic daughter. I would like to be able to say that this anticipation was rewarded with a book equal to the first in the trilogy, but sadly I was left feeling slightly disappointed. Don't get me wrong - it is certainly not a poor book and I would still strongly recommend it to anyone who enjoyed the first. I just felt that there was far too much crammed into the book, which is pretty hefty anyway at 500+ pages. This may cause easily distracted readers to give up rather than persevere through what is actually an exciting storyline overall. Henry Chancellor obviously has an incredible imagination, and the lengths he goes to to provide vidid, detailed descriptions of the book's many eccentric characters and places like Scarazand and the creatures Tom and Pearl discover there really bring the story to life, but at the same time can lead to a feeling that sometimes the narrative is moving too slowly. So much so that I personally feel that this is more suitable for boys of 12+ which is a pity as the story would definitely have appeal to boys a couple of years younger. Without giving too much away, the ending is darker than the previous book and leaves you with the promise of even more menace and adventure to come. If Henry Chancellor can just work at making the story move at a faster pace throught the middle section then the concluding book in this trilogy will certainly be a must-read. Personally, I am really looking forward to seeing how he brings the many strands of the story together to come to a final, satisfying conclusion. As a teacher of Graphic Design I really appreciate attractive book packaging and so I become a little disappointed when I feel that the covers of UK editions are not as attractive as their US counterparts. Fortunately this doesn't happen too often but two books that have recently landed on my doormat have caused me to frown more than a little. The first of these was Scott Westerfeld's "Leviathan". Don't get me wrong - the cover of the UK edition is a stunning illustration by Keith Thompson, who also produced the beautiful black and white illustrations throughout the book. But I really did fall in love with the cover of the US edition when I first saw it. There is something about the Steampunk aesthetic that really appeals to me, and I feel that the US cover (on the left) is a stunning example of this. The other book cover that has me slightly disappointed is Rick Yancey's "The Monstrumologist". Not only are the covers widely different in design, but these differences seem to add a little confusion as to who the target audience actually is. Now I've made my thoughts on age-banding very clear in a previous post so this possible confusion isn't my issue here - I just think the cover of US edition (left) is far more in keeping with the Gothic, dark tone of the story (or as much of it as I have read so far), evoking images of mad Victorian scientists and illicit experiements. The UK cover is fairly generic of many recent UK horror book covers (Darren Shan's Demonata series? ); it is "cartoon-ish" in nature and may attract younger readers who could find some of the content a little too dark. I guess there will be a lot of people out there who will disagree with me; after all, it is really just a matter of personal taste, but it would be interesting to hear the publisher's reasoning for making changes such as these. And why the need to add the subtitle "The Terror Beneath" to "The Monstrumologist"? Point one: it is set in a museum. In my opinion museums are magical places, along with art galleries and libraries, so any book that makes promises like this will immediately have me reaching for my wallet. Point three: the promise of adventure in exotic locations. Unfortunately, there have been many times when an impulse purchase of a book, based only on the cover design and the blurb, has resulted in disappointment. However, with 100% conviction I can say I was not at all disappointed with this book. The opening chapter is a killer with the description of a river of predatory beetles enough to get any boy slavering for more. It isn't long after this that we meet Tom who has been shipped off to stay with his Aunt and Uncle for the holidays. Yes, we've seen this before so many times, and yes the characterisation of Tom's eccentric Uncle and Aunt are fairly sterotypical, but it is the museum that is the stand-out creation of this book. If you liked the film 'Night At The Museum' then there is a good chance that you will like this book. I remember many a visit to the Warwick Museum as a child, awestruck by the fantastic, huge stuffed Warwickshire Bear just inside the entrance, always wondering what it would be like to be locked in the museum at night and whether the various animals came to life. Henry Chancellor has captured my childhood fantasy perfectly with his descriptions of magical taxidermy. The book isn't short on adventure either. 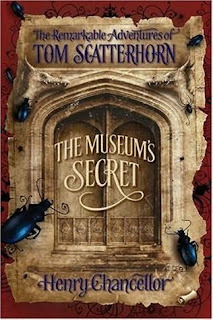 Tom finds himself whisked away through time where he meets the creator of the museum's magical stuffed animals and experiences the fantasy of an Edwardian icefair, a place brought alive by the author's vivid descriptions of the smells and sounds that Tom encounters. Villains? They will not disappoint you either. Don Gervase Askary and his creepy, emerald-eyed daughter Lotus ooze menace whenever they appear in the narrative. I won't say any more about these two as I would hate to spoil the surprises in store. It would appear that all the reviewers on Amazon agree with me. However, the book is not without its faults. The plot twists are a little convoluted in places, and the author's habit of whisking Tom away to places like India for only a few chapters could be a little confusing to less-focused readers. Henry Chancellor also causes the story to drag in a number of places through his excessive descriptive writing and some readers may find these passages a little boring; but please persevere as the book is rammed full of exciting moments of action and hair-raising adventure and if you are anything like me you will be left hungry for the sequel by the time you get to the final page. 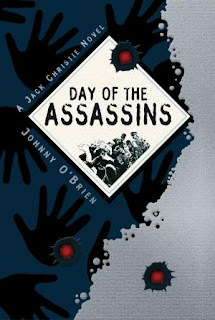 Day of the Assassins by Johnny O’Brien is a fast-paced time travel adventure set within an accurate historical context. It takes fifteen year-old Jack Christie and his friend Angus to the period just before the outbreak of the First World War. Following a desperate chase across Europe the adventure climaxes in Sarajevo, on the day of the assassination of Archduke Franz Ferdinand. Here, Jack must make an agonising choice with momentous implications for himself, his family and for humanity. The first thing you notice about Day of the Assassins is its stunning hardback cover, complete with bullet holes. And the attention to presentation doesn't stop with the cover..... inside the front and book covers you will find a map of 1914 Europe and a timeline respectively. And the story doesn't disappoint either. It is very much in a similar vein to the "Boy's Own" adventure stories of yesteryear, updated for a generation brought up on a diet of computer games and hi-technology. In simplest terms, it is a hugely enjoyable adventure story. However, there is much more to this story than just another time-travel adventure. Johnny O'Brien has clearly researched the events running up to the start of the Great War, and manages to weave his story seamlessly in with the actual events and real-life personalities of the time. Jack and Angus have to go through some agonising decisions and Johnny O'Brien carries this off very well, without sounding obviously moralistic. The feedback from some of the boys at school has been very positive so far, especially as they have been looking at the First World War in their history lessons. Their only criticism was that the technological aspects of the book were less believeable and a little unoriginal, but this didn't affect their enjoyment of the book at all. The author has promised more Jack Christie books and we are all eagerly awaiting the sequel. At last.... a few spare minutes to finally get this thing up and running. Please bear with me - this is the first time I have ever done anything like this (I didn't even keep any form of diary as a kid! Well, not for more than a couple of days at a time - hopefully I will be more successful with this blog). I have always had a passion for reading, and even now as an adult love reading books written for boys and young adults. I live in the UK and I have been teaching for fourteen years (currently an Assistant Headteacher) and have used my position to actively encourage reading for enjoyment, especially where boys are concerned. I hope to be able to use this blog to share my love of books and raise awareness of the vast wealth of 'boy-friendly' books that have been published since Harry Potter burst onto the scene. Many of the books I review will not necessarily be very recently published - there are many easily forgotten gems out there. 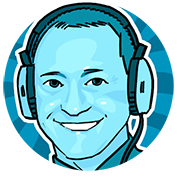 I hope you enjoy reading my ramblings and that you will come back again (and again). Please feel free to leave comments. When I get the time I will create a list of all the book I have reviewed (with links), sorted alphabetically by author for easy reference. Please bear with me whilst this is a work in progress.